We made this wedding cake for Alma and Steve recently. 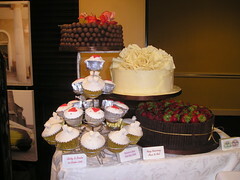 Each tier was made using two cakes which were put together and carved into the tapered shape. They were then iced as one cake with ivory sugarpaste. This is a beautiful photo Mary sent me of herself and her husband, Ronan, cutting their wedding cake which we made recently. I had a lovely call from Mary today thanking me for the cake. These were part of our wedding stand at the Cavan Crystal Wedding fair. The cupcakes are on their own stand. They are vanilla flavour but can be carrot cake mix or chocolate mix.